Pin Vises are for holding thin, cylindrical tools such as burs, bits, blades, chisels files, reamers, gravers or drills by one end, or used for drilling. These include hand drills, and revolving tool holders. 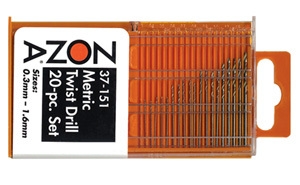 Zona’s miniature twist drill line is available in sets of metric, wire gauge and diamond coated miniature drills. 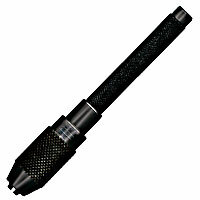 Ideal for use with small tools including chisels, files, reamers, beading tools, burs and gravers. Includes 2 collets with capacity range of 1/64″ to 3/32″ diameter. 3-7/8″ overall length. 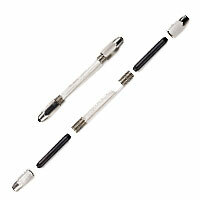 Comes with two double-ended collets in the handle with 0″ to .125″ (1/8″) capacity range. Hexagonal head keeps vise from rolling off of work surface. 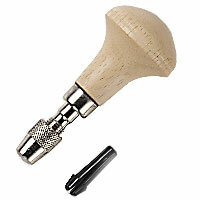 Holds small tools with round shanks including drills, burs, reamers, taps, needles, scribers, etc. Revolving head makes drilling fast. 4″ overall length. Archimedean or spiral hand drill for use with small wire size drills (#70 to #80). Push ring down to turn drill. Spring return makes drilling fast and easy. 4-1/4″ overall length. Small Steel Pin Vise has chuck capacity of 0.254 to 1.143mm (.010″ – .045″). 3-3/8″ overall length. Steel pin vises for holding wire, rod, drills, taps, reamers, etc. 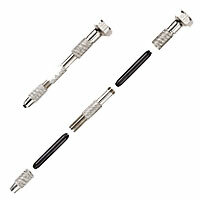 Both can be used in stationary drill press chucks and as an adapter for small drills and taps. 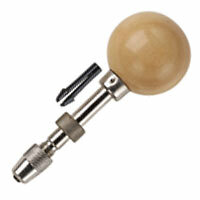 Ball-shaped pin vise head fits into the palm of the hand, while thumb and index finger twist the chuck. Useful for drilling larger holes in soft stock. Includes 2 collets with 1/64″ 3/32″ diameter capacity. For drills, taps and reamers. 3-7/8″ overall length. Large Steel Pin Vise has chuck capacity of 1.9812 to 3.175mm (.078″ – .125″). 3-7/8″ overall length. Steel pin vises for holding wire, rod, drills, taps, reamers, etc. Both the large and small pin vise can be used in stationary drill press chucks and as an adapter for small drills and taps. Comes with 2 reversible steel chucks. 3-7/8″ overall length. Four chuck sizes for drills, miniature reamers, files and small tools: 0″.05″, .03″.08″, .05″.10″, and .07″.11″. 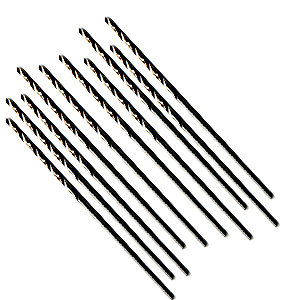 20-piece miniature drill set in plastic dispenser with one each of high speed twist drills in wire gauge measured in metric sizes 0.3mm – 1.6mm. Drill soft metals, wood, plastics and acrylics for jewelery, bead making, model making RC/plane/boat/train. Drill sizes in millimeters include: 0.3, 0.35, 0.4, 0.45, 0.5, 0.55, 0.6, 0.65, 0.7, 0.75, 0.8, 0.85, 0.9, 0.95, 1.0, 1.2, 1.3, 1.4, 1.5, and 1.6. 37-140 Swivel Head Pin Vise, 37-145 Double Ended Pin Vise. 0.4 – 1.6mm fit Zona Tool Holders: 37-120 and 37-130. 0.3 – 0.7mm fit Zona 37-160 Spiral Hand Drill. 0.254 – 1.143mm fit Zona 37-170 Small Pin Vise. 1.9812 – 3.175mm fit Zona 37-180 Large Pin Vise. These drills may also be used with other hand drills that hold wire gauge twist drills or rotary tools such as Foredom®, Dremel®, etc. with micro chuck. 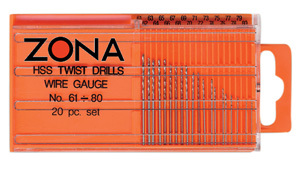 20-piece miniature drill set in plastic dispenser with one each of high speed twist drills in wire gauge #61 – #80. Drill soft metals, wood, plastics and acrylics for jewelery, bead making, model making RC/plane/boat/train. Any of these twist drill sizes can be used in the following Zona hand drills: 37-140 Swivel Head Pin Vise, 37-145 Double Ended Pin Vise. #61-#78 fit Zona Tool Holders: 37-120 and 37-130. #70-#80 fit Zona 37-160 Spiral Hand Drill. #61-#68 fit Zona 37-170 Small Pin Vise. They may also be used with other hand drills that hold wire gauge twist drills or rotary tools such as Foredom®, Dremel®, etc. with micro chuck. Click on the yellow chart at left for wire gauge dimensions in inches and millimeters.ll pin vise and other hand tools that hold wire gauges or in rotary handpiece with micro chucks. 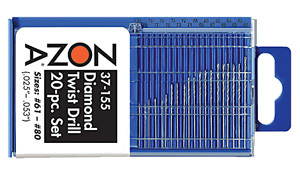 Diamond coated, wire gauge twist drill set in plastic dispenser. These straight shank drills are made of high quality steel with diamond coating. Set contains one each of drills #61 #80 (.025″  .053″). Any of these twist drill sizes can be used in the following Zona hand drills: 37-140 Swivel Head Pin Vise and 37-145 Double Ended Pin Vise. #61-#78 fit Zona Tool Holders: 37-120 and 37-130. 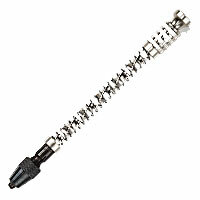 #70-#80 fit Zona 37-160 Spiral Hand Drill. #61-#68 fit Zona 37-170 Small Pin Vise. They may also be used with other hand drills that hold wire gauge twist drills or rotary tools such as Foredom®, Dremel®, etc. with micro chuck. Chart has wire gauge dimensions in inches and millimeters.